﻿ Everest Trek, Adventure in nepal, Adventure trek, island peak trek, everest trek with island peak, adventure everest trek, ebc trek, trekking in everest region, everest with island, everest trekking etc. Everest region, Gokyo lakes and some high passes trek and climbing to Kala patthar and Island Peak climbing is one of Nepal's most famous treks for Mountaineers, one of the magnificent breath-taking high mountain scenery, through the Khumbu - Sherpa valley. After a magnificent mountain flight to Lukla we follow the Dudh Koshi valley to Namche Bazaar one of the famous places on the trekking routes. The trekking trail via Thama to Gokyo is a gradual ascent up the valley passing through high passes and some rhododendron forest where the elusive musk deer and other animal can sometimes be seen. We cross the Renjo pass (5345 m) to reach the Gokyo lakes where we climb Gokyo Peak (5480 m) and enjoy one of Nepal most beautiful mountain sceneries including Everest, Makalu and Cho Oyo. From this point we take the trail to Lobuche, crossing Cho La pass (5420 m) and join the small village of Dzongla. After the ascent of Kala Patthar (5545 m) and the impressive up-close view of Everest, our return route from Kala Patthar and another peak climbing Island Peak and through Kongma La (5535 m) or the Imja Tse valley. While going down, we stop in Tengboche, a magnificent location with a fascinating monastery and one of the biggest Monastery in the region. With incredible scenery including magnificent views of Everest, Ama Dablam (6856m), Kantega (6809m), Kwangde (6194m), Nuptse (7879m), and Lhotse (8511m), to name but a few. Day 02: Kathmandu Valley sightseeing with guide. Day 03: Half day sightseeing and preparing for trekking and Island peak climbing. Day 04: Flight from Kathmandu - Lukla (2800 m) by plane then trek to Phakding (2600 m) or Manju, in 4hr . Great sight of the Kusum Kangru (6369 m). Day 05: Phakding or Manju - Namche Bazaar (3440 m), Sherpa village of the Everest region, in 6 hr. Climb up on the right bank of the Dudh Koshi, surrounded by Mountains rising above 6000 m.
Day 06: Namche Bazaar - Thame (3800 m) in 4 hr. Namche Bazaar visit in the morning. Many of the typical mani walls and prayer wheels are spread on the trail to Thame. Day 07: Thame - Marulung (4200 m) in 4 hr. Visit of the picturesque Thame monastery. Walk on the Bhote Koshi bank, the track is highly frequented by yak caravans coming down from Tibet and heading to the Namche market. Day 08: Marulung - Rermo Pokhari (4875 m Renjo Lake) Slope gently up through grassy areas. Camp beside the lake. Day 09: Rermo Pokhari - Renjo Pass (5345 m) - Gokyo (4750 m) in 5 hr. Magnificent panorama from the pass : Tengi Ragi Tau, Rolwaling Himal and the small Rermo Pokhari lake on west and Gyachung Kang, Everest, Lhotse, Makalu and the Gokyo lakes on east. Camp beside the lake. Day 10: Gokyo Peak (5480 m) ascent. Day 11: Gokyo - Nyimagawa (5050 m) in 5 hr. Crossing through moraines of the terminal spit of Ngojumpa glacier. From Thagnkang, climb up through gentle and grassy slopes to the foot of the Cho La. Day 12: Nyimagawa - Cho La Pass (5420 m) - Dzongla (4840 m) in 5 hr. The steep trail goes through blocks of rocks. After the pass, we shortly cross an easy segment of the glacier then descend towards Dzongla. Day 13: Dzongla - Lobuche (4920 m) - Gorak Shep (5100 m) in 6 hr. Easy descent on mountainside to Lobuche, then climb up through moraines towards Gorak Shep. Day 14: Gorak Shep - Kala Patthar (5545 m) - Dingboche. Day 15: Dingpoche (4400 m) Island Peak Base Camp (5120 m) The trail crosses the river and follows the valley for a while, passing beneath the magnificent 3000 m south face of Lhotse and other Mountain. The ascent of Island Peak includes little technical climbing, Only the last part, a steep (40 degrees) snow and ice ramp requires the use of fixed rope to reach the summit. 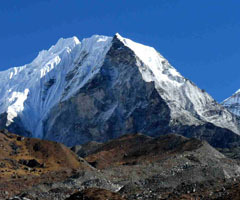 The scenery is absolutely breath-taking views, Lhotse, Makalu, Nuptse, Ama Dablam and Buruntse. Day 16 - 17- 18-19: Climbing Island Peak 6189 Mt. Day 23: Namche Bazaar - Lukla (2800 m) Numerous ascents down and descents through the forest, among rocky cliffs and sheer drops overlooking the river. 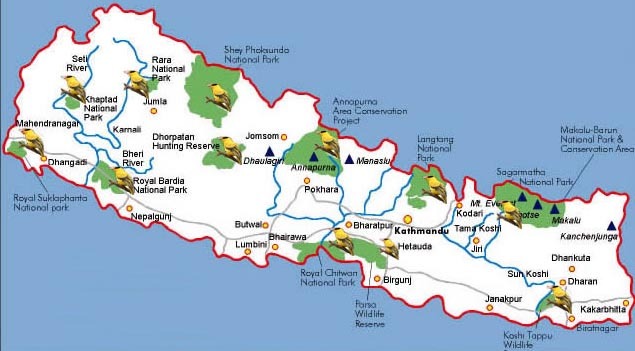 Day 24: Lukla - Kathmandu by plane and rest of the day at leisure. Day 25: Kathmandu free day or shopping.